A series of short presentations on/about/ inspired by water. Whether we live in a city, suburb or rural village, water is an essential component of our daily well being and life patterns. There are local and global issues to think about, areas of the world that are drying up and others in thread of floods. How does water shape our city? Why and how can we live on water? What is ‘happy’ water? How do we think, model represent, and communicate water? Each presenter shows 20 images and has 20 seconds per image. The 20 x 20 format was devised in Tokyo, 2003 for an event intended to give young designers an opportunity to meet, network and show their work in public. It now exists in over 800 cities and continues to spread globally. Join us Tuesday May 12th, 7pm at the Monarch Tavern, 12 Clinton Street Toronto for Water: Tiny Talks on Big Issues. Let us know if you’d like to join the forum - either as an organizer - or as an artist, creator, researcher, etc. Your project can be small or large, simple or complex. We are excited to collaborate with people of various skill levels and mixed media backgrounds. 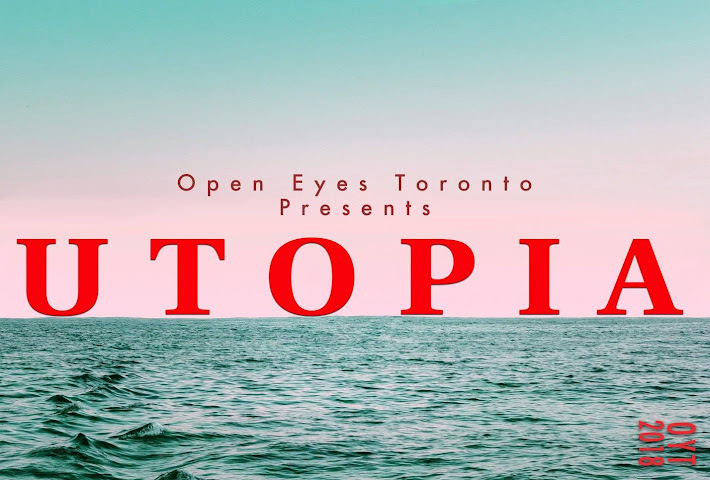 Open Eyes Toronto (OYT) is a creative collective that generates dialogue, design and response to current issues and daily life in Toronto. What started off as a small gathering of uninspired friends, has transformed into an event which attracts several hundreds of people and has held exhibitions in The Gladstone Hotel (2011), the Centre for Social Innovation Annex (2012) and MakeWorks (2013). It has become a forum to share ideas, create a dialogue, and inspire change in our communities.